Characterization of MAIT cells in human lymph compared with peripheral blood. 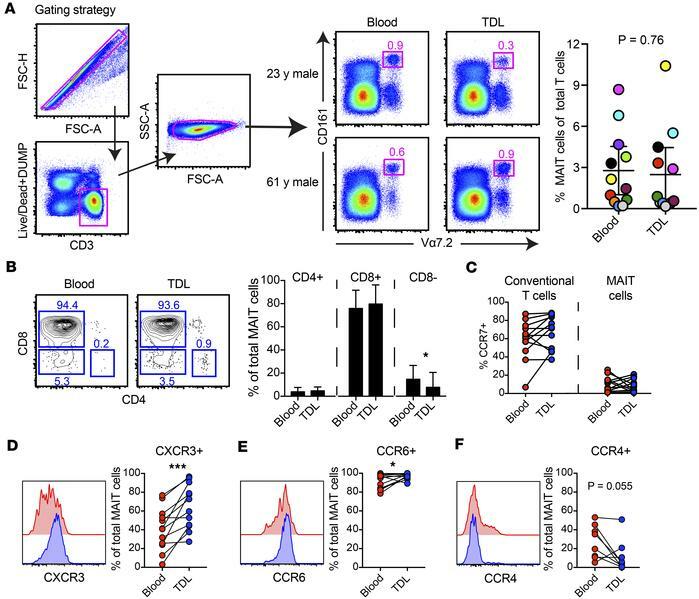 (A) Gating strategy, frequencies and (B) representative flow plots and subsets of CD161hiVα7.2+ MAIT cells gated on live CD3+ cells from human lymph and matched peripheral blood (n = 12 donors). (C) Comparison of CCR7 expression between total CD3+ cells and MAIT cells. Surface expression of (D) CXCR3, (E) CCR6, and (F) CCR4 on MAIT cells in human lymph and peripheral blood. Each point corresponds to 1 patient, and lines connect matched samples. Wilcoxon matched-pairs signed rank tests were performed. *P ≤ 0.05 , ***P ≤ 0.001.